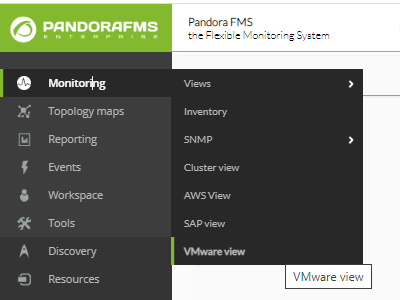 With Pandora FMS, it is possible to monitor virtualized environments with VMWare through one plugin, which is specifically created to extract information from the VMWare vCenter. Pandora FMS is able to extract both from the ESXi servers and from the virtual systems that are located in them. It is possible to see that in the sketch we can have so many ESXi servers as we need, and also, in ech ESXi server we can have as many virtual machines as we need. Also, it will be necessary to have a vCenter Server server, so it is the one that centralizes all the resources and send the data through datacenters. Before installing the vSphere SDK for Perl, we should install some dependencies. If it would be any problem during the installing of the dependencies previously mentioned, then it will be necessary to check the VMware guide in order to check that the installing process here mentioned is still working. If it would be any problem while installing, both with the SDK or with the previous dependencies, then it will be necessary to follow the VMWare official documentation. 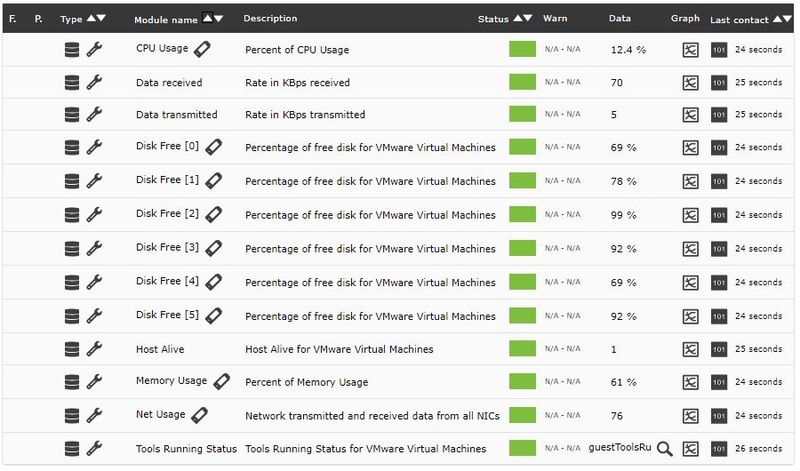 One recon task that is able to extract the ESXi host and the virtual machines that are availables through the VMWare vCenter. 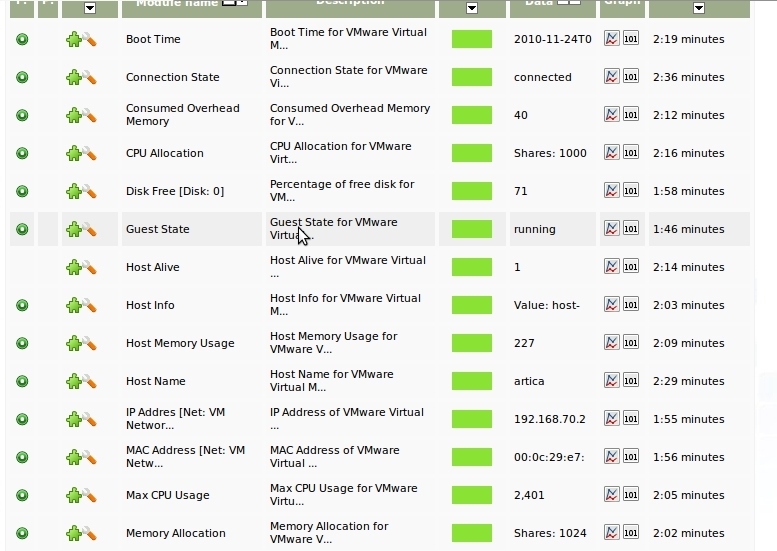 One plugin that gets the information to monitor as modules for each ESXi and virtual machine that has found in the recon task. With this system we get a remote agent for any ESXi host or virtual machine found. This will allow us to manage them as independent things, not matter the links that are between them in the virtualizing architecture. And also, each agent will have the corresponding modules for its monitoring depending on if it would be ESXi or virtual machine. NOTE: To use VMware plugin and the recon script activate pluginserver and reconserver is required. As we have said before, the Pandora FMS WMware plugin extracts the information through the vCenter. In order to avoid an overload in the vCenter database, the plugin creates an intermediate buffer for each agent. This intermediate buffer consists on a file for agent host in the file /tmp that is updated every 300 seconds (5 minutes).This way, only one query will be done to the vCenter when the file will be too old. NOTE: It's very important to consider that the files with name kind xxx_pandora_vmware.txt are used by the plugin to extract data. If these files are deleted the performance of the vCenter database could decrease. To register the VMware Monitoring Plugin we will use the authomatic plugin register through pspz packages. To do this, we should click Register plug-in in the submenu of the Manage Servers menu. After this, we will see the following image, where we should choose the vmware-plugin.pspz file and press the Upload button. If the operation is successful, then it will show the following screen to verify the operation. If we press on the Manage plug-ins submenu from the Manage Server menú, we will check that the VMware Monitoring Plugin plugin will be shown in the plugins list. 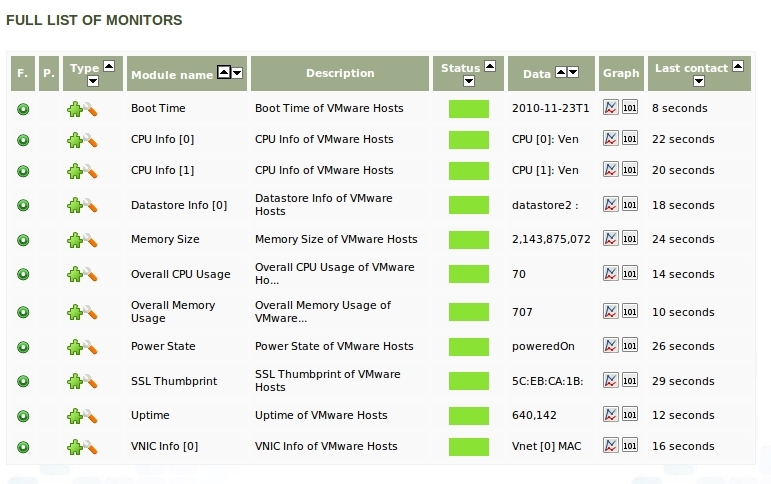 In the plugins list it will appear one field as the one that is shown in the following image showing that the VMware Monitoring Plugin is already installed. With this, we have registered the plugin that allow us to get info from the VMware architecture. Description: This plugin gets information of VMware vCenter. Now we have to register the Recon Script that does the ESXi host and the virtual machines search. 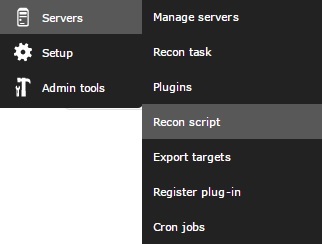 To do this, we have to select the Manage recon script submenu of the Manage Servers menu. Once we see the Manage recon script initial screen in the submenu, we have to press the Add button. After this, we will see the window to fill in the data of the new Recon Script', where we fill the data as in the example following. In the Script fullpath field, it is necessary to specify the interpreter or program with which the script will be executed (for us it will be Perl), and the full path where the script is located. Once the form is filled in, we should press on the Create . Once the script is registered, we will see one screen that will inform us of that the operation is working fine and it will show the script registered in the list. After doing this we will see the following image, that shows the Recon Taskgeneral view. In it we press on the Createbutton to create a new task. server: IP of the server where the VMware vCenter is located. username: User to have access to the vCenter. password: Password to have access to the vCenter. datacenter: Name of the datacenter to monitor. pluginname:Name with which was registered the VMware plugin (in the authomatic register it's always the VMware Monitoring Plugin). If you want to monitor several datacenter, then it will be necessary to create one Recon Task for each of them, specifying the datacenter name in the parameter of the right script. Finally, we press the Addbutton to create the new Recon Task. When pressing the button the following screen will be shown. It will inform you that the operation was successfull and the new Recon Task will be shown in the list. Now we have a recon task Recon Task that will be executed with the selected interval and that will create the appropriate agents extracting the information from the VMware virtual architecture. To see the Recon Task result, we only need to check that an agent has been created for each virtual machine and ESXi host. For doing this we need to go to the Agent Detail submenu from the View Agents menu. Then it will show the list with all the agents where will be the agentes of the VMWare virtualized system that the recon script has found. In our case we have two ESXi machines and two virtual machines. In the list, the ESX host are with the ESX_ prefix and they are named according with their IPs. For the virtual machines is used the name of the machine writting the VM_ prefix before. If we press on the name of an agent we will see the Pandora FMS agent view, where we can see parameters such as the agent IP and in its description we see that it is an agent discovered with the Recon Script for VMware virtual architectures. In the following section we are going to explain the information that reports each module in detail. Boot Time: Last date where the virtual machine was booted. Consumed Overhead Memory: Memory consumed by the virtual machine in MB. CPU Allocation: Information about the resources assigned to the virtual machine CPU. Disk Free: Virtual Machine Free Disk Percentage. (It will be one module for each disk that that the virtual machine contains). Host Info: Information about the VMware host. Host Alive: Module kind Keep Alive that is 1 if the virtual machine is on execution and 0 otherwise. Host Memory Usage: Consumed memory by the virtual machine in MB. Host Name: Name of the Host Operative system. IP Address: System IP address (It will show one per network interface available). MAC Address: System MAC address It will show one per network interface available). Max CPU Usage: Maximum limit of the virtual machine CPU usage. Max Memory Usage: Maximum limit of the virtual machine RAM Memory. Memory Allocation: Limit of the resources for the memory. Memory Overhead: Memory used by the virtual machine above the requirements of the host operative system in Bytes. Overall CPU Usage: Basic statistics on the CPU usage in Mhz. Power State: Current state of the virtual machine power. Private Memory: Memory in MB that is given to the virtual machine of the non shared memory. Shared Memory: Memory in Mb that is given to the virtual machine of the shared memory. Tools Running Status: Current state of the VMWare Tools execution installed in the host operative system. Triggered Alarm State: State of the VMware alarms. Uptime Seconds: Virtual machine Uptime in seconds. Virtual Image Path:Virtual machine configuration file path(.vmx). Boot Time: Last time the host was booted. CPU Info: CPU general information ( it's created one module per each ESXi CPU). Datastore Info: Datastore general info ( it's created one per each datastore that is availabel in the ESXi). Memory Size: Total amount of the host physical memory in Bytes. Overall CPU Usage: Addition of the use of all CPUs in Mhz. Overall Memory Usage: Physical memory used in the host in MB. Power State: State of the host power. SSL Thumbprint: host SSL print. Uptime: Host Uptime in seconds. VNIC Info: Information about the host virtual network interfaces. 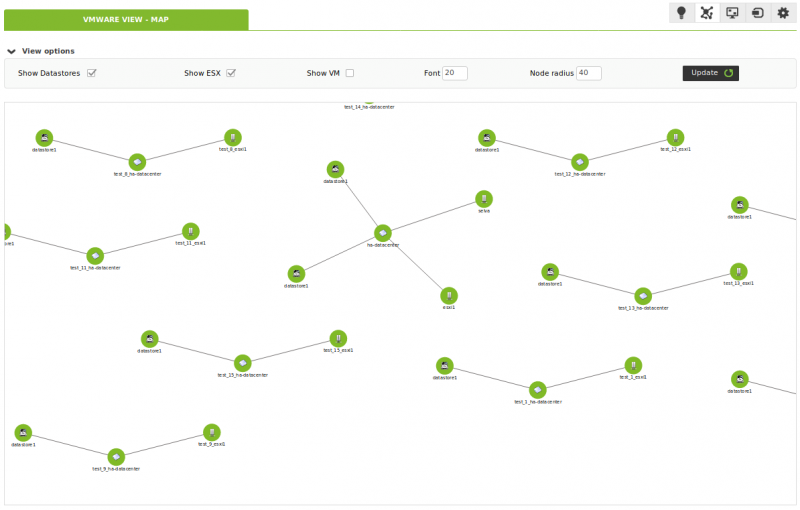 Together with the VMWare plugin, two extensions are distributed VMware Manager and VMware View.VMware View allows to visualize all the VMware architecture components in an easy way. Besides, with WMware Manager you could manage virtual machines, stopping, starting, reseting or canceling the activity from the Pandora FMS console. From this moment the WMware plugin extensions will be availables. 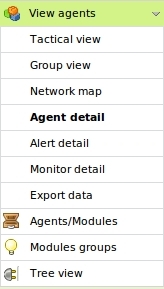 To begin using the WMware architecture visor, click on the WMware View submenu in the View Agents menu. 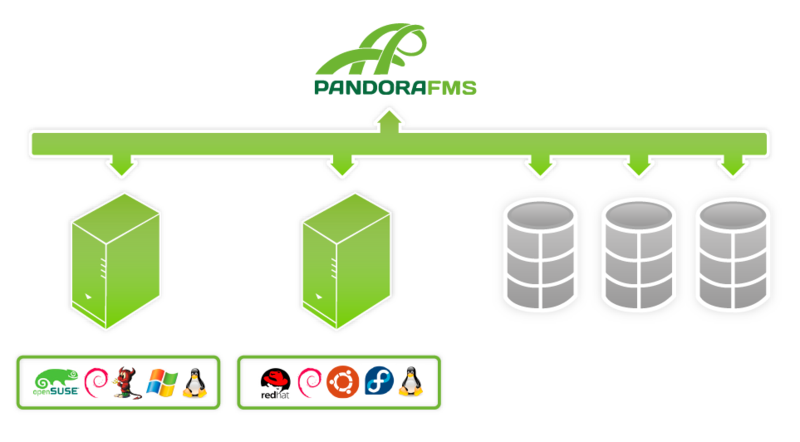 The map contains the elements of the VMware architecture(virtual machines, ESX,Datastores and Datacenters) with different icons that identify them and also the Pandora FMS agents state that represent each element. Besides it's showed the relationship that exists between the virtual machines, ESX and DataCenter. This way, with a quick view you could see the state of the VMware architecture in a very easy way. This extension has some options that help to improve the architecture visualization hidding elements, enlarging the letter size and allowing to do zoom to could see the elements closer. 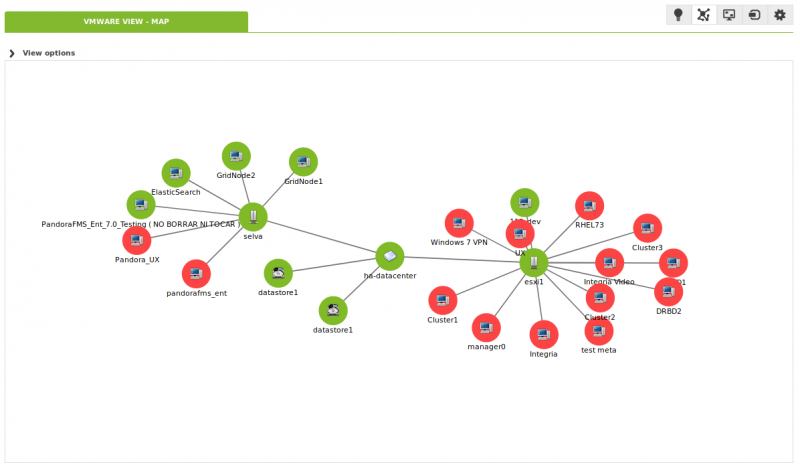 To use the VMware Manager extension you should go to the operating view of one agent that corresponds with a virtual machine in the VMware architecture. In this view you could see an icon with the WMware symbol the corresponds to the extension. 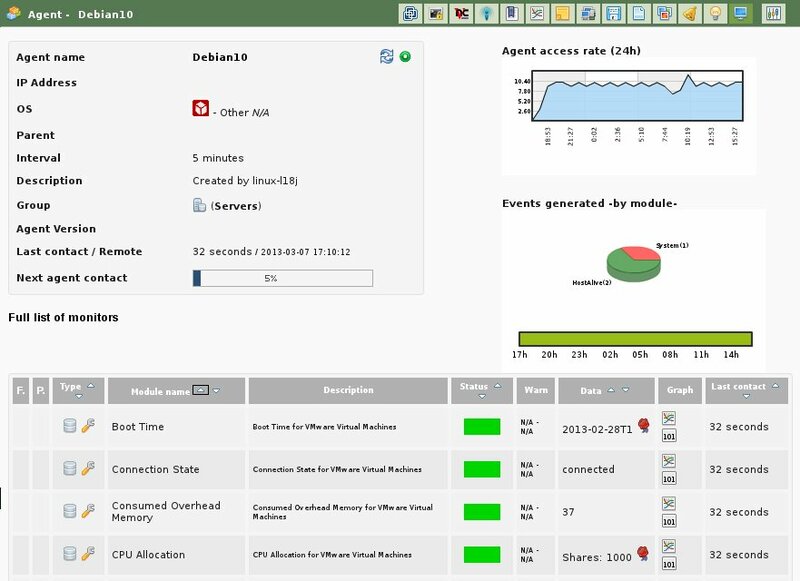 The VMware Manager extension allows to manage virtual machines from the Pandora FMS console. The extension shows the current state of the virtual machine with a color code (green= on, orange=off and grey=stopped), besides, in a combo it shows the available status and allows to change the state of the virtual machine selecting it clicking on the Change Status button. By default, the WMware Recon Script adds all the checkings previously explained. 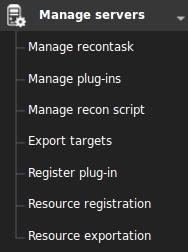 To could choose which checkings you want to include and which ones are not availables, the Recon Script can read your configuration of one file. To show to the Recon Script which is your configuration file, you should add the parameter -reconconf <path_file> to the call created in Pandora FMS. The configuration file has modifications or restrictions to the Pandora FMS modules that are created by default. So, if one module is not in the configuration file, it will be added with the default values. With the Recon Script configuration file we can fix maximum and minimum values for the Warning and Critical status, or disable the module. <module> name = <nombre>; desc = <description>; limits = <min_warning> <max_warning> <min_critical> <max_critical>: The module will be created with the name and the description given and the tresholds will be also be defined for the maximums and minimums of the Warning and Critical values. The modules are referenced by their short name, a name equivalent easier to write in the command line. The correspondence table between short and expanded names is in the following section. To monitor the ESXi we have decided to disable the Uptime module because we consider it's not necessary. The rest of the available modules will be shown with the default parameters. For the virtual machines we have disabled the modules IP Address and MAC Address. Besides, we have defined the parameters for the modules Max CPU Usage. Remember that the modules that aren't disabled will be created with the default values. NOTE: All the errors related to the configuration file are shown as events in the Pandora FMS console, so in the event screen you can see if some problem has occurred when reading the configuration file.